Replace the default logo image, set your company information and taxing options. Create a new database if necessary. This is a chapter of Invoice Manager for Excel's help document. To get the help document, download and install Invoice Manager for Excel, open the default template by clicking "Invoice.xlsx" shortcut on Windows desktop, and then click "Help" on the "Invoice" ribbon tab. If you have installed Invoice Manager for Excel version 4.12 or higher versions, click the "Replace Logo Image" button on the "Invoice" ribbon tab and follow the wizard to specify your own logo image. That's all you have to do! 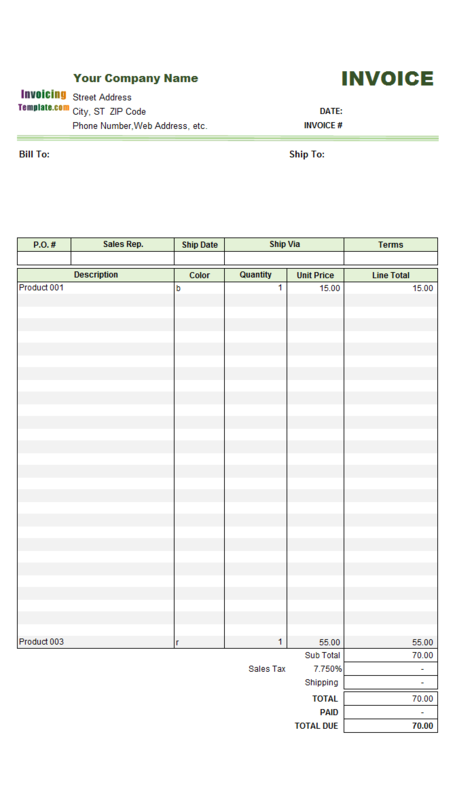 Open your invoice template in Microsoft Excel. Switch to the "Invoice" worksheet if it is not active (or is not the current worksheet). Switch to the Invoice ribbon tab if it is not activated. If you are running an earlier version of Invoice Manager for Excel that does not provide the "Replace Logo Image" command, now you should unprotect the "Invoice" worksheet. By default, the "Invoice" worksheet is protected to avoid overwriting formulas accidentally. To unprotect it, in Excel 2007/2010/2013/2016 click Review tab / Changes group / Unprotect Sheet. Switch to design mode by clicking the "Design Mode" button on the Invoice ribbon. On the "Invoice" worksheet, enter your company information to replace the default text labels, such as your company name, address, and contact information. Right click the Logo image, and select Properties from the menu. Click the Picture property, and then click the ... button. Browse to the folder containing your icon file. Select and open the icon file. Drag the border of the image object to resize it, if needed. If you don't need the LOGO image, follow the steps below. Click the LOGO image to select it. Deleting the LOGO image leaves an empty area to the left of the Company Information section. You may like to move the entire Company Information section to fill in the empty area. To do this: Drag your mouse to select the entire Company Information area, including Company Name, Street Address, City, ST Zip Code, etc. ; Push your mouse key on the border of the selected area; drag it to the new location. Exit design mode, by clicking the Design button again. In Excel 2007/2010/2013/2016, you can find the command in the Changes group of the Review ribbon tab. Save your invoice template by clicking Office button -> Save in Excel 2007, or by clicking File -> Save in Excel 2010 and 2013/2016. 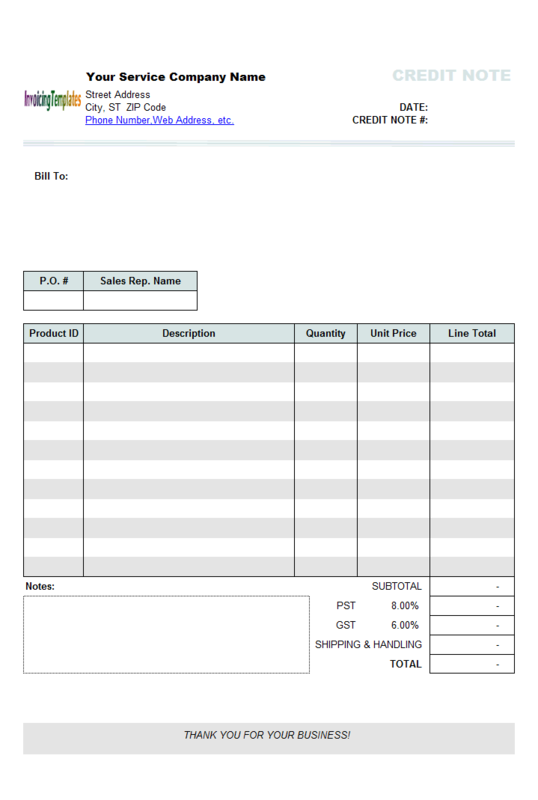 Refer to Invoice Template with Logo for more options about the logo image. 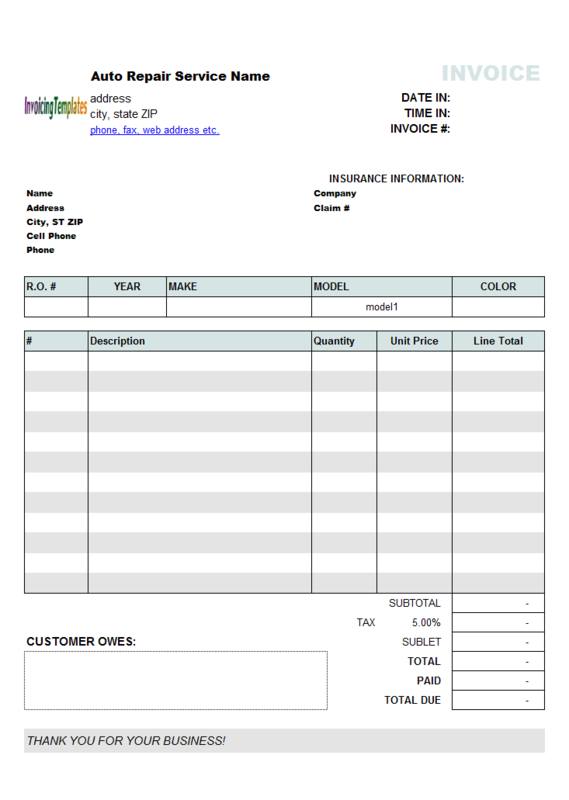 For more information about customizing the invoice template, please see Customizing Invoice Template. Settings the number of taxes, for example changing from two-tax to one-tax, is implemented by hiding the tax rows on the worksheet. If you choose "One Tax", the first tax row identified by the "oknTax1" name is visible; if you choose "Two Taxes", both the rows identified by "oknTax1" and "oknTax2" names are visible. This works well with the default invoice template shipped with Invoice Manager for Excel installer program, where the "oknTax1" and "oknTax2" names are put on two separate rows and no other critical content are located there. However if a template is deeply customized, for example the "oknTax1" and "oknTax2" names are moved to one row, or other fields are put on the rows where the "oknTax1" and "oknTax2" name reside, the feature of setting the number of taxes may not work properly. In this case, you need to customize the taxing cells manually by making the rows hidden or visible, or by moving the cells inside or outside the printable area. To set up the taxing rules using the "Settings" window, follow the steps below. Click Settings button on the Invoice worksheet to open the Settings window. Choose your tax system: No Tax, One Tax, or Two Taxes. If you have 2 taxes, click the option Tax2 is applied to tax1 so tax2 is calculated on the sum of the price+tax1. 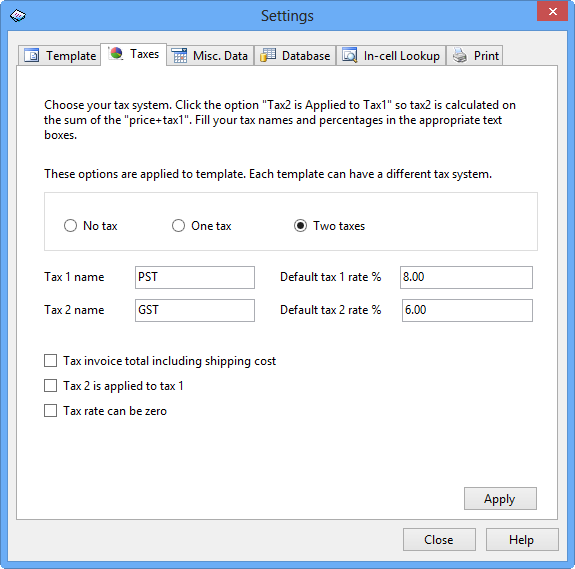 Fill in your tax names and percentages in the appropriate text boxes. Close the Settings window and return to Excel. Click the Save button on the Excel toolbar to save the modified workbook. Additionally, each product has a Taxable attribute that controls whether the tax rate will be applied to the product. For each invoice, you can also set its tax rates and Taxable attributes. On the Invoice worksheet, click the Settings button to open the Settings window. 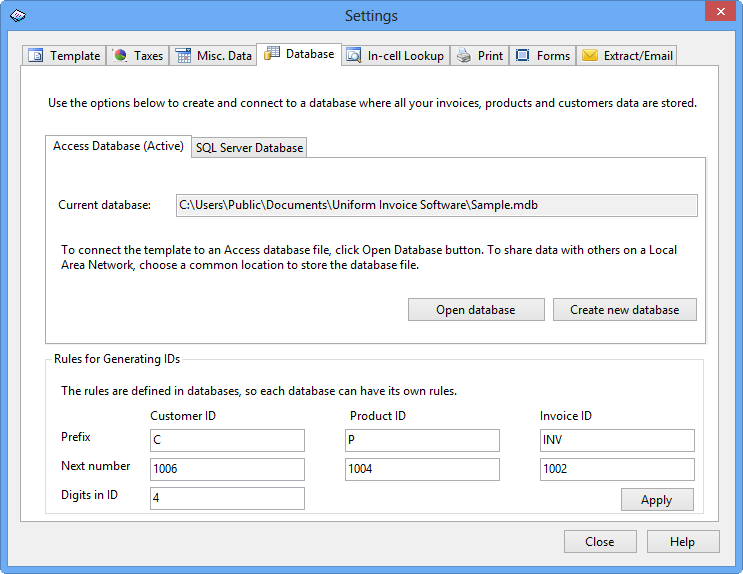 Click Create new database under the Access Database tab. Select a folder to store your new database file and enter the database file name. Click Save to create a new database file. If you want to open the newly created database for current workbook, click the Open database button under the Access Database tab. Then select the database file you just created. If the database is successfully opened, the database name will be displayed below the Current Database label on the Invoice worksheet. The full path and file name of the database is stored in a hidden cell in the workbook. To make the workbook connect to/open the new database automatically next time you open it, click the Save button on the Excel toolbar to save the workbook. 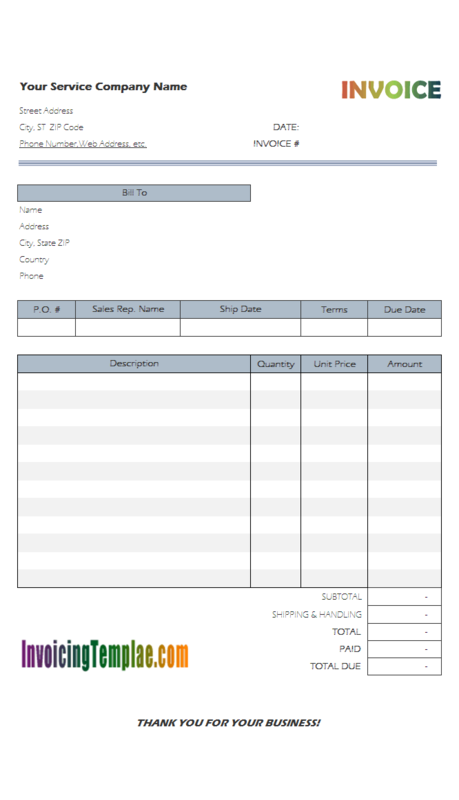 This is a variant of the invoice template with 4 columns. The template is set with no tax and shipping address. 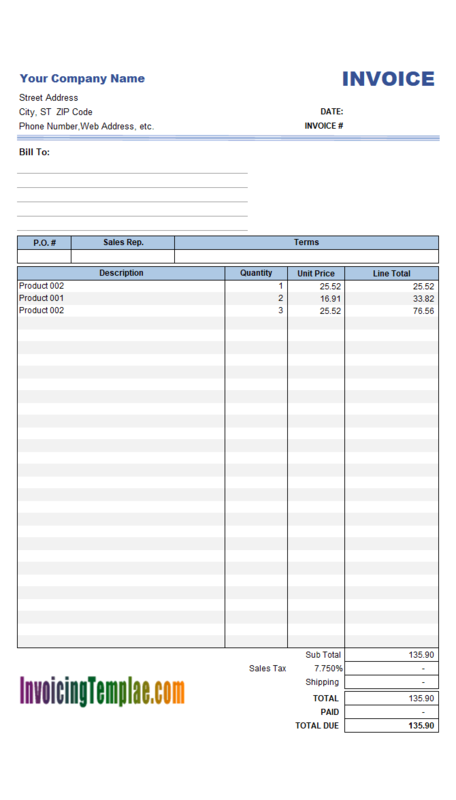 This sample of customizing invoice templates is named with the keyword "cosmetic". A new column "Color" was added to meet the requirements of the cosmetic business. 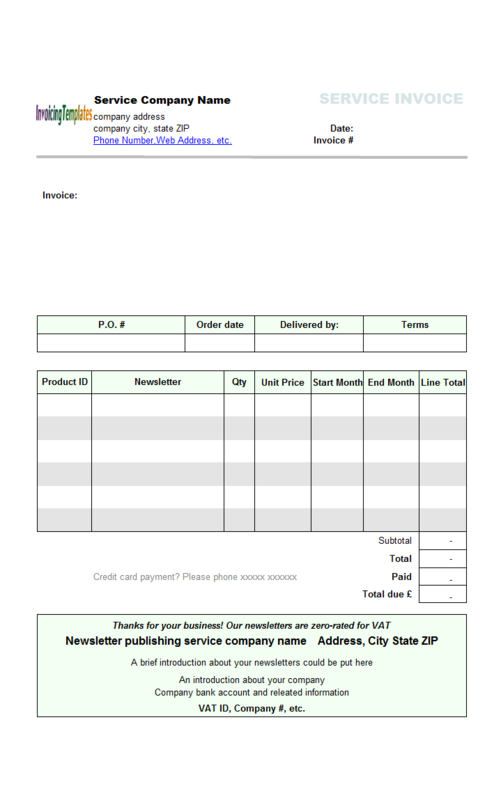 Service Credit Note Template is a variant of Credit Note Template. It differs from the original one by moving all shipping fields out of the printable credit note form, making the template more suitable for service business. This is a variant of 5 Price Levels (Sales, Amount). It is suitable for service business as it moves out all the shipping-related fields. 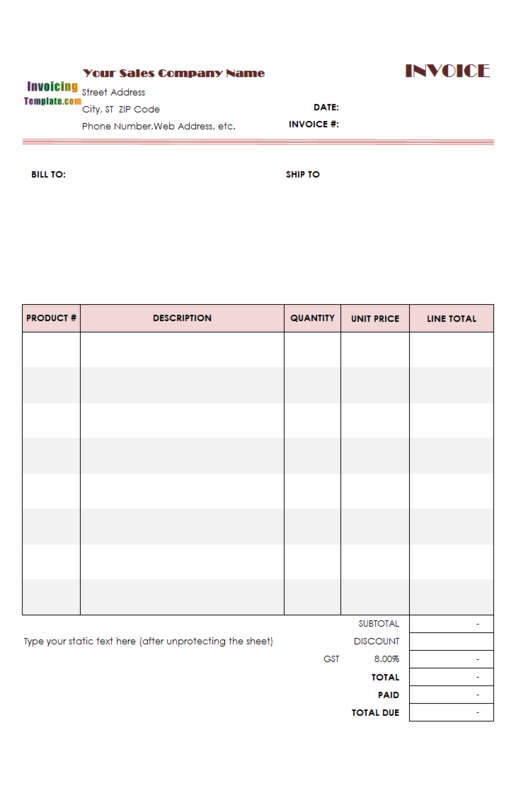 As a consultant you need a beautiful invoicing template to bill your clients, yet the template should be simple and easy to use. 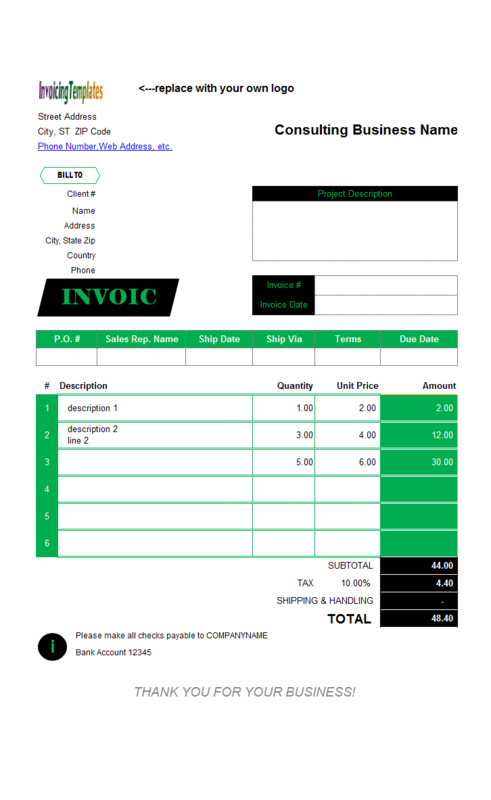 Simple Consulting Invoice Template might be your choice for creating invoices. 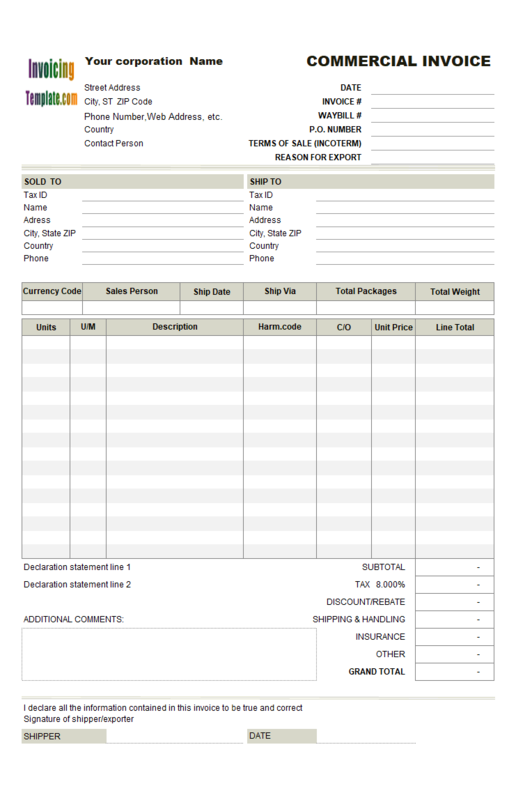 By moving the shipping fields back into the printable area on the Excel Invoice form, the original service invoice template now becomes a sales invoice template that supports per customer discount amount.